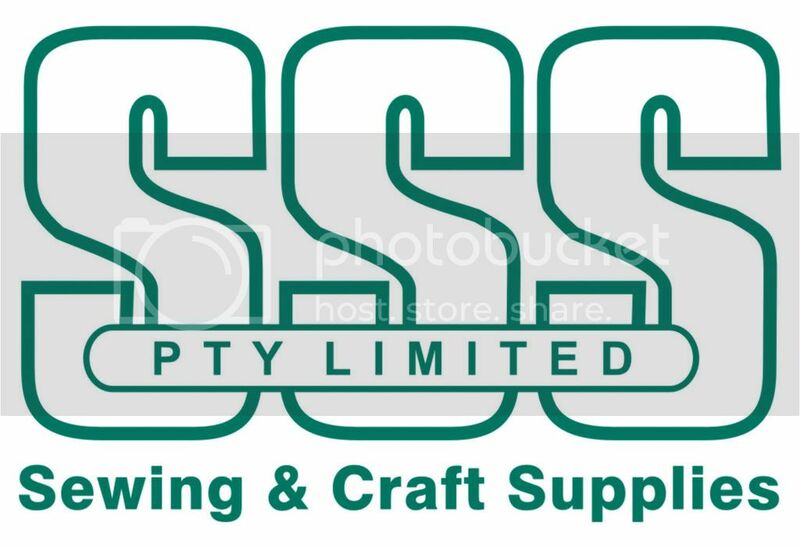 Sydney Stitches and Craft Show starts tomorrow Wed. Aug 19th and goes for 5 days........I'm sure you'll find a few FISKARS bargains amongst all the Stands this year.........go check them all out! 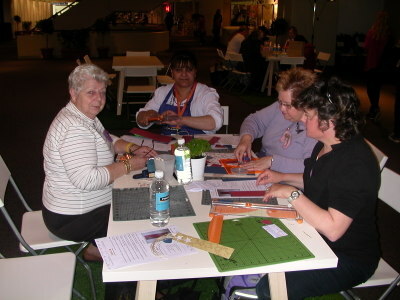 Have you seen the latest info on the upcoming Stitches and Craft Show in Sydney? We crafters LOVE a Show right? So What's New & FREE? Curious about what to expect? Well there's the usual fabulous products from over 150 craft retailers in Australia and the Craft Labs where you can learn lots of new things but what's actually brand spanking new? ALL the FREE things you can do... 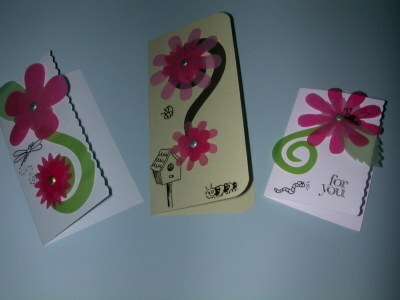 Craft Bars - whether you know how to sew, knit, embroider or do papercraft, discover a new project in under 30 minutes. Reconstruction Zone - take a garment and re-fashion it on the spot using a sewing machine, some thread and trims. Handmade Nation - watch a film all about the DIY craft and design movement in the United States. Studios - presented by craft retailers. Discover or learn something new in under an hour. Wardrobe Refashion & Burdastyle have to say. Inspiration - be inspired by the pop up displays around the show and be sure to see Crochet Cool, a new spin on crochet from Italy or the fabulous Teacosy Revolution by Tara Badcock. This year it is being held at a different venue.....The Royal Melbourne Showgrounds so it should be easy to get to and if I can find my way there.....being the country hic that I am I'm sure others that live in Melbourne should also be able to find their way. I'll be there on the first day of the Show....which is next Wednesday March 11th with my good friend Carolyn. I'm so looking forward to seeing all the new exhibits this year. .....it sounds so darn exciting! Ross,Angela,Claire and the whole Living Creatively Team work so hard to put together what we as crafters are looking for! So Melbournites.....jot down the dates.....March 11th - 14th...opens each day at 10am! Have you been over and checked out the Living Creatively website recently. Living Creatively's current issue number 8 is now live online for you to enjoy. Have you been over to the Living Creatively site over the past few days? 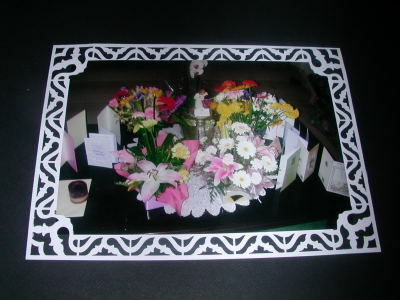 This Punch is an absolute card makers dream and Scrapbooker's are loving it also......so nice to be able to go around a whole Border.......and I love how you can mat a photo with it also like in the pic below......all you need to do is trim your cardstock to 1" wider and longer than your photo and you'll have a perfect mat for your pic every time. 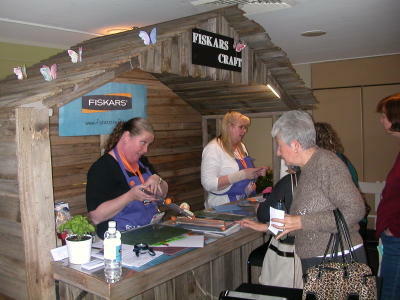 Have you seen the latest pics of the Fiskars Craft Team at working at the Sydney Stitches and Craft Show? Take a look see here on location Living Creative ! 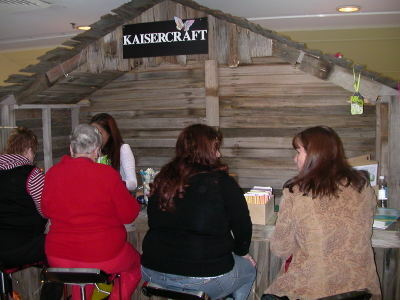 The display floor’s set up – with each indie crafter selling and displaying their wares on tables surrounded by chairs – allowed visitors to take a seat, and watch and learn from them. 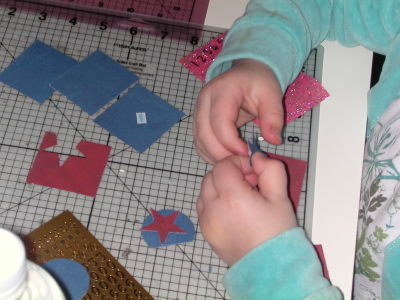 It also enabled the crafters to spend some quality face time with the friends they’d come to know through their blogs. Textile designer Kristen Doran did a roaring trade on her Matryoshka fabric panels, which allowed novice sewers to simply cut, sew and stuff their own Babushka softies. Her screen-printed cotton and linen swatches also struck a chord with some of the oldest visitors at the show, proving that good style has no age barrier. Kristen told Living Creatively she was thrilled her products appealed to someone who, she’d estimated, might have learnt to sew on a treadle-powered sewing machine. “She said, ‘A friend of mine saw your stall yesterday and told me that I just HAD to come and see it for myself’,” Kirsten said. The popularity of all-in-one crafting and sewing kits – where buyers make a finished product without visiting a haberdashery store, or even getting up off the sofa – showed no signs of abating. Whether it was a traditional cross-stitch project, a vintage-inspired softie [Audrey and Maude], or a funky clutch purse [Nicole Mallalieu Design], they proved a practical way for crafters to dip their toes into new areas. 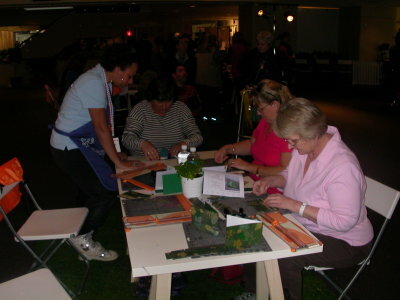 The “Make and Take” stage, set up in front of two old-school garden sheds, allowed visitors to experiment with papercraft tools from Fiskars and Kaiser Craft. “The purpose of the stage was to highlight the techniques you can use in papercraft and show people how to use the tools – it was a real case of ‘try before you buy’,” said Living Creatively stage host Claire Stewart. 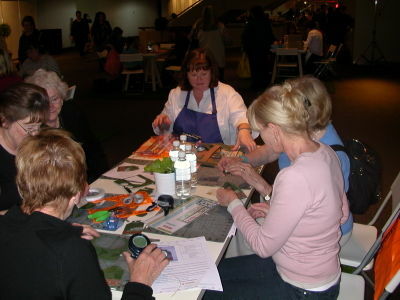 The key theme was “encouraging”, and it was great to witness visitors – amateur and seasoned crafters, young and old – wandering past the stage, getting commandeered onto a craft table, and emerging 20 minutes later with their own handmade card or bag tag to take home. Well .......what a great start to the Stiches and Craft Show today. 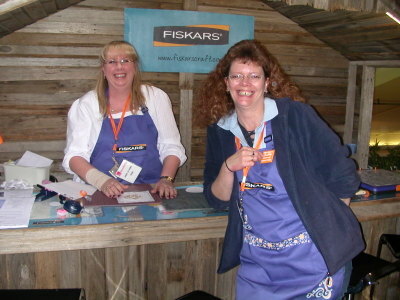 Here are a few pics from today...firstly....Lorraine -Lee and Robyn in theFISKARS CRAFT garden shed.....these two ladies are Demonstrators for FISKARS! 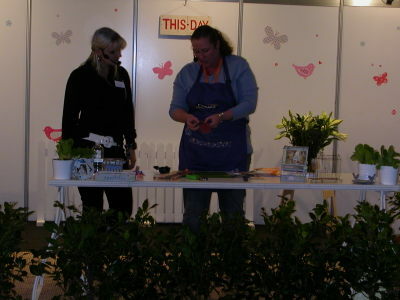 ....and in the second pic we have the lovely Azza teaching a Make "n" take with a table of happy crafters! Check out the new GREEN FISKARS craft mat......YES....we also have the PINK ones here as well! They are slightly larger than the 12 x 12 craft mats.......and so nice to see a flower design on them as well........the Living Creatively Area takes up all of Level 3.......it's just amazing! Hop over to the fabulous Living Creatively website www.livingcreatively.com.au to learn a little more about the wonderful history of Fiskars. Fiskars have produced three cinema series videos highlighting the amazing stories behind the 350 years of Fiskars.